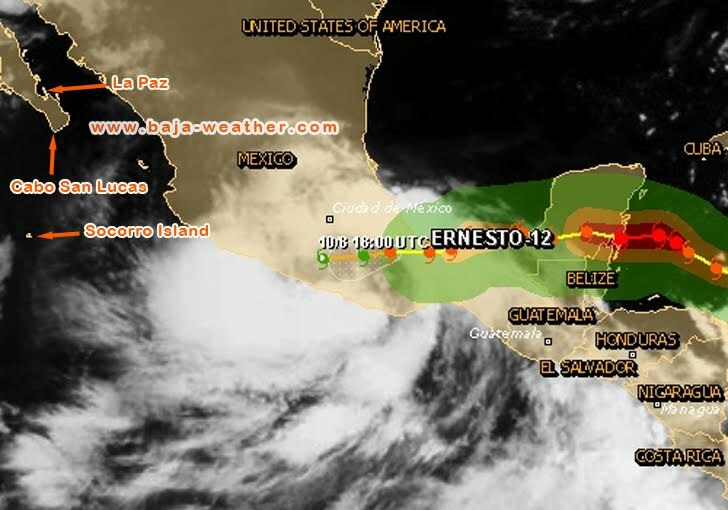 Ernesto dissipates over southern Mexico and heavy rain threat continues.The circulation of Ernesto has been disrupted by the high mountains of southern Mexico. about 215 mi/345 km WSW of Veracruz Mexico with maximum sustained winds of 25 mph/35 km/h. have the potential to become a tropical cyclone (hurricane) in a day or two. Ernesto is expected to produce additional rainfall accumulations of 2 to 5 inches over the Mexican states of Veracruz,Tabasco, Puebla, Oaxaca and Guerrero through Friday night. Isolated maximum storm total amounts of 15 inches are possible in association with Ernesto. These rainfall amounts may produce life threatening flash floods and mudslides.